LOVE this comforter! I use it year round and toss it in a large washer when needed. The white has not diminished with a 2 times a month wash. Delivery was quick as always. I've had a good experience shopping with O! Changing your comforter every season is exhausting. That's why the LUCID Down Alternative Comforter is designed with 375 gsm fill weight for year-round comfort. The down-free fill is hypoallergenic for a clean sleep environment that won't cause sneezing. The box-stitching keeps the hypoallergenic fill evenly distributed for cozy, snuggly, warmth from head to toe. And the brushed microfiber fabric shell is breathable and just as stylish as it is warm. 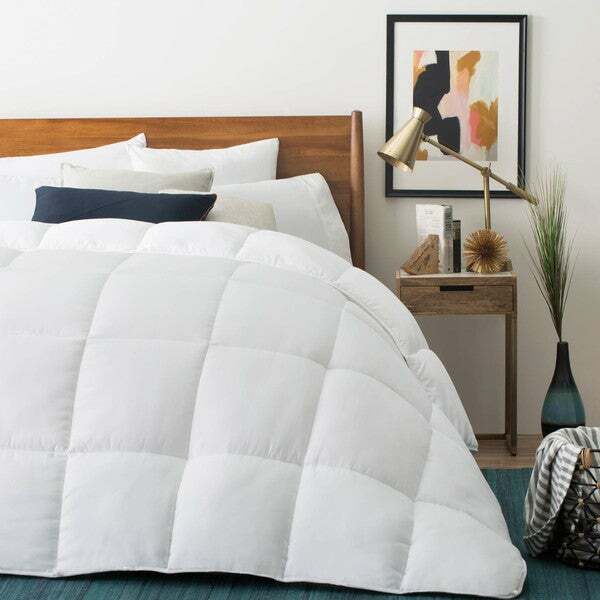 With four corner loops, this comforter also works as an easy insert for any of your favorite duvet covers or it can stand alone. Right out of the package, this comforter was super soft. I love the individual square stitching, it keeps the filling from shifting around. I really liked how the binding was finished. I have owned a down comforter for several years, and this comforter is just as warm and light. I received this comforter free from the manufacturer for a product test review. Bought the oversized king. It was a perfect fit for our California king bed! So soft and Comfty!!! Not too thick wont over heat under it. Would recommend and purchase again!! This comforter is great! It fits well with the bed and seems to be really high quality. We were originally interested in getting this product because it is hypoallergenic. We love it so far! The comforter is not very heavy but pretty warm - perfect for the fall/winter months where we live! Since the comforter is not very think, it compacts very well. I love this comforter! It is SUPER soft and I love that it's pretty lightweight. I've only had this comforter for about a week, but I would definitely recommend it to anyone! I also love that it has the loops so I can add a duvet cover (which I fully intend on doing). Love love love it!! We needed a California King and this comforter was true to measurement. Unlike other comforters we tried, fabric is soft and the fill evenly distributed. Love that it is lightweight too and has well stitched binding and loops to use inside duvet covers. Haven't tried laundering yet. Overall good quality and price. I love this comforter! It is SUPER soft and I love that it's pretty lightweight. I've only had this comforter for about a week, but I would definitely recommend it to anyone! I also love that it has the loops so I can add a duvet cover (which I fully intend on doing). I still can't get over how soft it is..Love love love it!! I love, love this comforter!!! It's beautiful, extremely soft, super light weight and oh so comfortable! Love the feel of it when I climb into bed or grab it to snuggle up in while watching a movie or just relaxing! Folds up small not bulky, easy to take with you anywhere. I was given this free to try it out... so happy about that! I definitely recommend it! This comforter seems to meet all my expectations. The down alternative fixes two of my complaints with real down: that it is too heavy, and that the feathers eventually start to stick out and poke you! It has a good weight, is extremely soft, and quality is very good. My little girl loves to curl up in it! Great value! I would purchase this again. I'm so happy with this purchase! I love a nice white comforter and this was definitely a good choice. Feels good to the skin too :) The price and value, along with the soft fluffiness...makes this a steal! this comforter is so soft and fluffy... I love it! buying another one! Light weight but warm. Exactly what I wanted. Wonderful!! It's light weight but keeps me warm. I enjoy that it helps regulate my body temperature so my sleep is more restful. Keeps you warm, but not too warm at night, looks good, and is very soft. We love it. Nice quality and the tabs are a great feature to hold the duvet in place. The comforter is neither light nor heavy, it’s lofty without being weighty and holds its shape when the bed is made. We both really like this fluffy comforter. It is the perfect weight, doesn’t weigh down those toes, but does keep us warm! We actually prefer this to the down filled alternatives. Very comfortable and has the extra corner ties to hold it in the duvet cover! The most disappointing thing about this comforter is the size. I have the California King Lucid Mattress and ordered this comforter in the CA King size as well. But, it's obviously a King size and not a CA King. I hate that it doesn't fit the mattress appropriately. It washes well, but sleeps pretty hot. At first it smelled weird but once it aired out, it was great. Super fluffy! SUPER soft and a great value for the price. The comforter was delivered in vacuum-sealed packaging to save space and shipping costs. Soft and fluffy!! Super excited for guests to have this on our guest bed. This comforter was definitely worth the money. I read all reviews before picking one and this got the best. It’s full and soft and like a big puffy cloud on our bed. I bought it to be a duvet insert because our old one didn’t fill it out well enough. But it’s good enough to use without the duvet! Very pleased. "Having a very hard time finding a duvet cover that will fit the oversized king & California king. Is there a cover with the same dimensions as the comforter?" I purchased Becky Cameron duvet cover set item# 23999728 for my king/cal king size. It works well, has ties in corners and stays in place well and is soft and comfy. "When will the King size be available?" "Is anyone experiencing shedding with this item? More than typical wear & tear?" Have not experienced any shedding at all. Absolutely not. My comforter is perfect after 2 washes. No. Actually just washed mine and haven’t noticed any issues. "How much does the oversized queen weigh?" Hello! The oversized queen weighs about 7.9-pounds. Thank you! Lucid. Beds for the Whole Family. "Where do I find a 116 x 98 duvet cover for the Oversized King?" "Does it have corner ties to keep the duvet in place?" It has loops sewn on to each corner that you can tie a duvet to. It's great. "Can you use it in a Duvet cover?" Yes, I have a cover over mine.